I’m a little later than I intended getting up my entry for last week’s #MenageMonday hosted by Cara Michaels. You can swing by the original site for the prompts and other entries. Judge Miranda Gamella awarded my Fantasy Fighter story the Judge’s Pet distinction, and I learned a little more about Hazuki’s family in 250 words. Warm muted light from the stained-glass window blanketed the room in sleepy stillness. Tsukiko Akiyama gave in. The reasons she shouldn’t be there troubled her thoughts but could not stir her to leave. She should be in America, in case her daughter needed her. Sacred energy was conspicuously absent from this old church. Even the hellfire in her companion’s eyes excited, rather than worried, her. Sitting together on the floor of the desecrated church, Tsukiko ran her thumb lightly over Melantha Karahalios’ knuckles. Melantha leaned in and kissed Tsukiko with tender firmness that warmed her whole body like her respectable husband never had. Tsukiko felt beautiful again for the first time in too long. Then the church doors were knocked in disruptively. A tiny old woman stood righteously in the unfiltered light of day. The old woman glowered at the two women before her. Melantha looked between Tsukiko and her mother, licking her lips. For once, Tsukiko met her mother’s gaze with defiance not deference. Tsukiko stood to tower over her mother. I won Cara Michaels’ #MenageMonday again this past week! 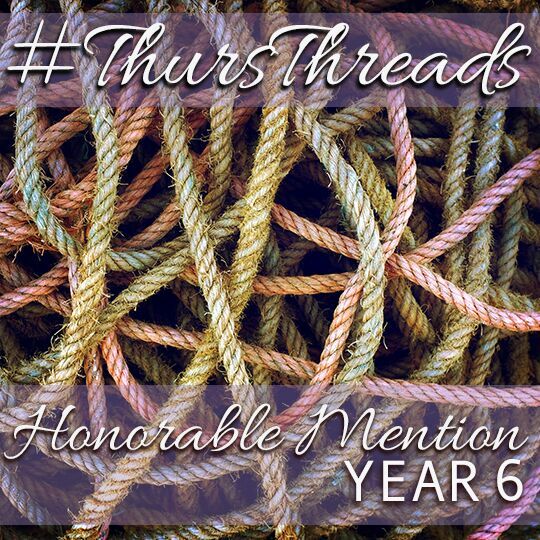 This time judged by Siobhan Muir, whose #ThursdayThreads I was given an Honorable Mention on by judge Louisa Bacio! As has been my pattern this year, Monday was set in my Fantasy Fighter universe you can learn more about on this site, and Thursday was set in the Magical Girl Alternate Universe of my Four Sisters story–which you can learn about through my Twitter posts. Also, since Thursday was Valentine’s day, we were encouraged to wax a little romantic. I encourage checking out the prompts and other stories through the links above. Major Stevie Cannon initiated a background system diagnostic while she visually scanned the forest around the old enclosure. The result always came back normal or better, but she still checked every time she thought she heard the alien’s voice in her mind. Every time she held still for more than a minute. Trying to sleep was hell. No movement. The structure appeared empty, but there was a lead lined under level that scans didn’t penetrate. Biomass Delta was smart. A lot smarter than it was supposed to be. If it had learned how to hide from government scans that would explain why Major Cannon had been called in. Normally the boys in the bio division did their own cleanup to keep their secrets in house. Personally, Major Cannon agreed with the need for the country to develop and control the next generation of weaponry before their enemies even knew it existed. The second part of that had been particularly troublesome recently. If she had it to do over again, she still would have signed on for the moon base project, but she couldn’t shake the irony of being asked to cleanup a weapons program gone sideways. Her right arm became a literal energy cannon and she activated her personal force field as she approached the enclosure. As convincing as her prosthetics were, precious little of Stevie Cannon was still human. It was time to get her fellow weapon back under lock and key. The purple hued magical elf, Emathyst, pushed past the bullet scarred door of the dive bar. Desperate characters huddled in isolation over their drinks in the dim light. She exchanged a nod with the grizzled bartender and made her way to the desperate character at the bar, staring into his shot while his pint foamed. Her luxurious hair floated up and away, leaving her normal black faux hawk. The Giant’s Ring was once more a trinket on a chain around her neck, her elegant dress replaced with her biker’s leather jacket, torn jeans and combat boots. She was again the punk chick, Violet Li. “You alright?” Violet sat next to Cole Dooley. Cole did his shot and moved on to staring into his pint. Violet smiled as the bartender brought her Shirley Temple. Cole took a gulp of his beer and nodded glumly. Violet gripped Cole’s hand on the bar firmly. 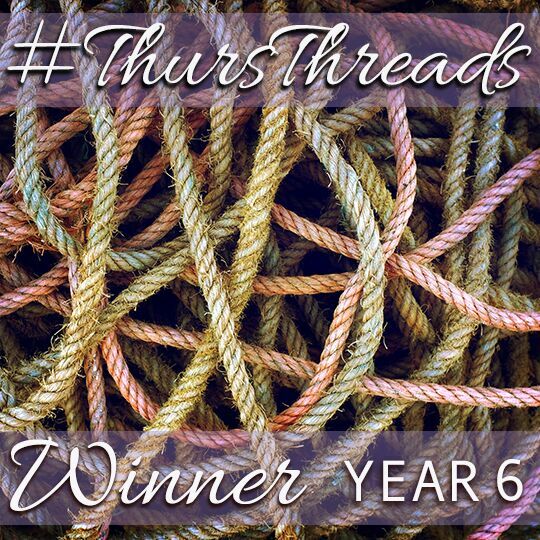 I had the good fortune of winning both Cara Michaels‘ #MenageMonday as judged by Ruth Long this week AND Siobhan Muir‘s #ThursThreads as judged by Cara Michaels! Winning either of those is a pretty great accomplishment–though for any writers seeing this, I recommend giving them a shot anyway just for the excellent practice and to see all the great stories. Winning both of them, I just don’t have the words. So instead, I’m letting you guys have both stories! The first is from my Fantasy Fighter universe which you can learn more about on this site, and the second from a Magical Girl Alternate Universe of my Four Elven Sisters story which you can learn more about on my Twitter account. Hazuki Akiyama rushed past her mother to her grandmother’s bedside. The room was warm, but the tiny teenager had no coat to add to those by the door. She had stayed in America an extra week, but hadn’t expected to come home to this. Her grandmother was even smaller than Hazuki, and appeared to be sleeping. Hazuki took the old woman’s hand. “A demon? !” Mrs. Hamada, their neighbor, gasped from the other side of the bed. Suddenly aware of the other person in the room, Hazuki clammed up. Hazuki’s mother cleared her throat and placed a hand on Mrs. Hamada’s shoulder. Hazuki’s mother winked at her daughter as she escorted Mrs. Hamada out of the room. Once Hazuki was alone with her grandmother she took a breath and returned her focus to her mentor. The old woman sat up with a hacking cough, then blinked until her eyes refocused. The dopey dog that hung out on the corner was no longer what anyone would call little. An infusion of dark energy blew his bug eyes up like balloons, lifting his head to his new height of eight feet. Burn patterns leading up the street suggested his salivary problem had become more aggressively acidic too. Esmeralda clenched the Crystal Arrowhead in her fist and took a deep breath. The darkness had never attached itself to an animal before. How was she going to calm his spirit to seal the breach? Before she could transform into the magical archer, Vedania, she felt a tug on her sleeve. It was the sophomore, Coco, clutching the Crown of Heaven with hope shining in her eyes. Esmeralda gave Coco the Crown last week to save both of their lives. Still, it bothered the senior how much the younger girl enjoyed turning into an elf and saving the day. This wasn’t a game. “Any idea how we do that?” Esmeralda dodged the question. “Yes!” Coco slammed the crown on her head. In an instant the underclassman’s stupid pigtails fell off, her ears became pointed, and the Crown transformed into a halo. Now the magical saint, Oaklie, was dressed in a floofy gold party dress instead of Coco’s school clothes. She even loved their sickeningly girly costumes. This wasn’t dress up, either. “Douglas loves scritches behind his right ear!” Oaklie pointed ahead as wings of light sprouted from her back. I recently had the honor of judging for Siobhan Muir’s #ThursThreads where for now I’m exploring Lucy’s story in my New Team Neoshieldfront universe. You can see who I judged as winning that one here. 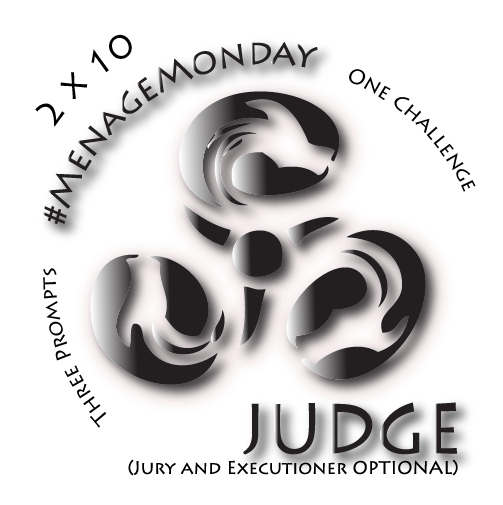 This post, however, is because just yesterday I got to judge Cara Michaels’ #MenageMonday and that one comes with a badge for judging! You can see the three prompts and all the entries on the initial post, jump to the results post for who I deemed the winners, or just keep scrolling down for my own ineligible entry from my Fantasy Fighter universe in 248 words. Wintery wonderland stretched out on all sides. Its vastness masked the ancient steamer’s speed but for falling snow rushing past the windows, as if fleeing the train’s destination. Hand carved benches and warm décor gave the passenger car an old world charm. Hazuki Akiyama kicked her feet contently and stared out the window. “It’s like being in a Christmas snow globe.” She mused aloud. “That ends at sundown.” The man across from her rumbled. The man’s face was hidden by the hood of his night black robe. His attire would have better suited a time long before even the invention of the antique they were riding in. “Ah! Gomen! I didn’t wake you, did I?” Hazuki bowed deeply. There was far more space in the passenger car than Hazuki was used to. She sat across from the only other passenger on reflex. He waved a large scarred hand reassuringly. Hazuki tucked her feet under the bench to keep them still. The man sat up straighter, resting his hands on his knees. Hazuki planted her fists dramatically on the hips of her poofy pink dress.